Last year I bought a ‘97 Ford Crown Victoria, it was pretty much all my dealership had within my price range and it was either take it or be stuck in Terrace without a vehicle of my own so I took it. I was apprehensive about buying it partly because it was a Ford. My dad was never a Ford fan and often told me that it stood for “Found On Road Dead” or “Fix Or Repair Daily.” My dad is no longer with us so I didn’t have to deal with any potential disapproval, though I can’t help but think if he were still alive he’d cringe at the thought of any family member owning a Ford. It also wasn’t exactly the prettiest car around or the smallest, it’s quite large for a sedan. Another reason I didn’t want to take it was that my first vehicle was a Suburban and I would’ve preferred to replace it with an SUV. The final thing was that it was red, my first vehicle was black and I wanted to continue with that color scheme. However, beggars can’t be choosers. Considering the circumstances and the urgency of my situation, I went with the Crown Vic and paid for it in full with cash. The biggest advantage of going that route was that it was paid for up front and I had no loan payments to worry about at all, the disadvantage was that it wasn’t quite what I was looking for. But, all in all, it had four wheels and went from A to B, so I set aside my wants in favor of fulfilling my immediate needs. It’s not a perfect vehicle, it has more than its fair share of quirks but one of my biggest pet peeves is the fact that it has, hands down, the WORST cup holders ever manufactured. Many a time I’ve bought a drink, put it in the cup holder and upon the first sharp turn had the bottle fall out and land somewhere between my feet. This is not only really irritating but also incredibly inconvenient. It leaves me with two choices: 1) leave the bottle to roll around until I can park somewhere, pick it up and put it back in the cup holder, or 2) fish around for the bottle while I’m driving, find it, grab it and put it back in the cup holder. I usually exercise option 2 as I’m adept at finding the bottle while continuing to watch the road and steer, I also usually wait until there’s no oncoming traffic to be on the safe side. And even then, once I do get it back in the cup holder, I know it’s only a matter of time before it happens again. This is a major problem for me as I almost always have some sort of beverage while I’m driving. The cup holders themselves are only about an inch deep and a full bottle of any type of drink is going to be top-heavy, making it susceptible to tipping over. And this is Kitimat, land of the sharp turns. So what’s the solution? I thought I might be able to put it on my dash board, the only thing was I had no idea if it would fit without buying it to find out. I bought two, just in case and a number of problems arose: 1) I have no room on my dash for one of these on the driver’s side, and 2) even if I did have room it wouldn’t fit because the window comes down at such a sharp angle there’s no room to put anything in it, and finally 3) it’s only big enough for a can to fit into. I never drink anything out of a can while I’m in my vehicle, it’s always bottles. This looked like it was going to be a waste of money as I bought two of them and had no way of using them, so I held onto them just in case. They were only about $5 each anyway so it wouldn’t be that much of a financial loss, but it was the principle of it all that bothered me the most. Fast forward to a couple of months ago when I bought a rotary tool, again from Canadian Tire. 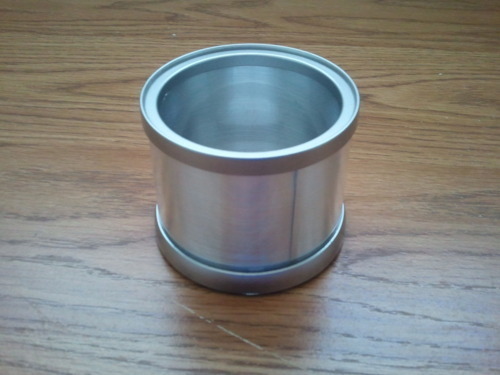 I got to thinking: what if I took those cup (or should I say “can”) holders and cut them with my dremel tool? So I got to work removing the top and bottom of the cup holders, this was a little problematic because even at its lowest setting, the rotary tool still spins pretty fast. Seeing as this is a plastic cup holder I’m cutting up, the friction from the cutting tip causes the plastic to melt very briefly then harden again. This made for extremely messy edges, so I changed the tip and sanded off the excess melted plastic that had hardened in big clumps. Once I had the top and bottom off, I then cut the plastic cylinder in half. Again I needed to sand the edges, it removed the excess plastic but left some gouges and scratches but I wasn’t really that concerned with making the braces pretty. Now I needed to test it and see if it would work, so I took the two plastic cylinder halves out to my car and just used masking tape to hold the pieces in place. If it didn’t work or if I needed to make modifications I could easily remove the masking tape and fix the extensions. If it did work, I could remove the masking tape and replace it with something less conspicuous. After taping my contraption in place, I tested it out. This was the proverbial moment of truth. First, I tried an empty can. Again, I never drink cans in my car but I tried it just to be thorough in my testing and cover all my bases. I plopped it in, wiggled it around and it showed no signs of tipping over. Next, I tried a 500 mL water bottle. I use these fairly often and when I placed it in between my cup holder extensions it held the bottle without any problems. Last, I tried an empty Coke bottle. After the wriggle test it showed no signs of even being able to move on its own as the plastic braces held the top of the bottle right up against the dash board and kind of wedged it in there. This was an unexpected and pleasant surprise and it’s still easy to put a bottle in and take it out, so the tests were successful. Much like my car, it isn’t pretty but it does the job. 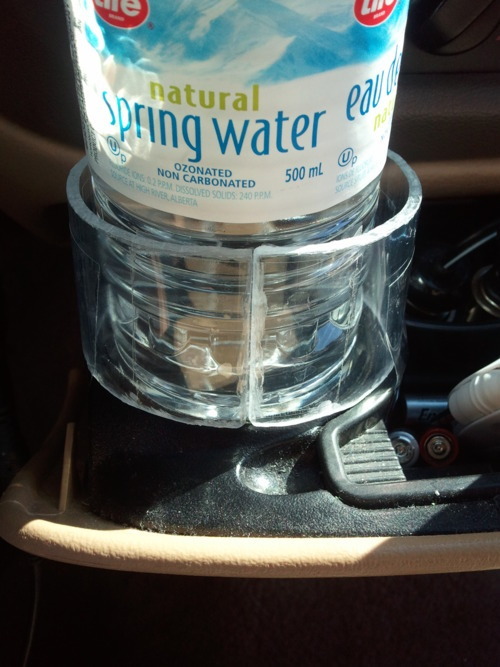 I was ultimately able to make use of the cup holders that I bought from Canadian Tire, though not in their original form. But that’s the way of us Native people: make the most of what you have available or what you can get cheaply. If what you have doesn’t work, modify it with whatever else you have on hand with until it does meet your needs.